But after a string of losses in the state, multiple Republican strategists in California are pessimistic about the GOP&apos;s ability to recruit top-tier challengers, especially for 2016, when presidential-year turnout is expected to benefit Democrats. It&apos;s a similar problem Democrats face at the House level across the rest of the country, where GOP waves in 2010 and 2014 have made recruiting in some states a challenge. Richard Temple, a California GOP consultant, said a major problem for Republican candidates running in the state is that they are weighed down by the national GOP&apos;s brand. He said the image could be fixed if the field of candidates Republicans recruit reflected the party&apos;s growing diversity, but he said without donors believing those candidates can win, getting them to run will be hard. "I just think the reality is they&apos;re not going to get anybody good," Temple said. "They can&apos;t make the case for donors to put money here, and that’s the rub. We accept generalized reactions so, the view from donors is [Republicans] can&apos;t win." Republican strategists say part of the problem is that Republican hopefuls have seen a downward trend in the number of seats the GOP has held in the state&apos;s massive congressional delegation over the past few decades. 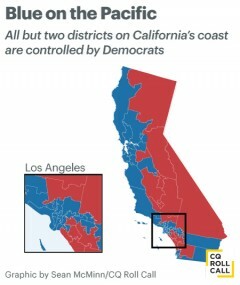 California&apos;s district map is a blue strip along the Pacific Ocean , with Republicans holding districts in the more rural farmland and desert inland. In 1993, the GOP held 22 of the then 52 seats in the state. Today, Republicans hold just 14 seats in the now 53-member delegation. 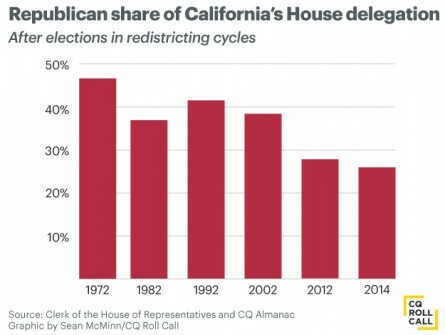 In fact, Republicans saw a net loss of one seat in California in 2014 while nationwide the GOP netted more than a dozen House seats to rise to a historic 30-seat majority. That net loss came despite millions in spending across four different districts to try and oust then-freshmen Democratic Reps. Scott Peters, Julia Brownley, Raul Ruiz and Ami Bera. All four went on to win re-election by varying margins, while Republicans lost the open seat of former Rep. Gary G. Miller, who retired from the Inland Empire-based 31st District. While national Republicans say they can compete in those four seats they targeted last year, only one of them is rated competitive by the Rothenberg & Gonzales Political Report/Roll Call: Bera&apos;s Sacramento-based 7th District, which is rated a Democratic Favored contest. But Republican strategists had no names to mention as potential GOP challengers to Bera — a seat Obama carried by a slim 4-point margin in 2012. Last Cycle, Bera defeated former Rep. Doug Ose by about 1,500 votes, after Democrats both ran a strong ground operation and successfully painted Ose as an out-of-touch rich businessman. • In Peters&apos; San Diego-based 52nd District, Republican Jacqueline Atkinson announced a bid earlier this year. But she has struggled in the fundraising game, bringing in just $49,000 in the third quarter — not nearly enough to compete in the pricey media market. And GOP operatives add that even some Republicans at the local Chamber of Commerce support Peters — a deterrent for other strong Republican candidates to get in. "Donors have other priorities, and Scott Peters is not one of them," said one California Republican strategist. "[The NRCC] has been really aggressive in talking to people and courting people ... but you’ve got the downtown establishment that likes Scott Peters because they are not ideologically Republican." • Over in Ruiz&apos;s Palm Springs-based 36th District — which Obama carried by a slim 3-point margin in 2008 and 2012 — Republicans had a candidate in Indio Mayor Lupe Ramos, but she dropped out in June citing a lack of enthusiasm for her bid. • Earlier in 2015, a potential pickup opportunity emerged when Democratic Rep. Lois Capps announced her retirement from her competitive Santa Barbara-based 24th District. But Republican state Assemblyman Katcho Achadjian, whom GOP strategists touted as a top recruit, has not lived up to fundraising expectations. And with the district&apos;s historic inclination to support Democrats in presidential years (Obama carried the district by an 11-point margin in 2012), the seat could be a challenge for Republicans in 2016. Still, while Republicans say 2016 is an uphill climb, they are optimistic the party can make inroads in the state in the future. "I think for 2016, I think it’s going to be highly unlikely that Republicans mount a significant challenge in congressional races that they did in 2014," Temple said. "But ... the Republican Party is fighting for its competitive life [in California], and it will adapt and survive. That’s what things, people and institutions do." Related: McCarthy&apos;s Future Won&apos;t Affect GOP&apos;s Hold on His Seat Roll Call Race Ratings Map: Ratings for Every House and Senate Race in 2016 Get breaking news alerts and more from Roll Call in your inbox or on your iPhone.